Definition at line 44 of file itkNarrowBand.h. Definition at line 61 of file itkNarrowBand.h. Definition at line 51 of file itkNarrowBand.h. Definition at line 62 of file itkNarrowBand.h. Definition at line 57 of file itkNarrowBand.h. Definition at line 50 of file itkNarrowBand.h. Begin is the first valid iterator position within the region. End is ONE PAST the last valid iterator position in the region. Definition at line 48 of file itkNarrowBand.h. Definition at line 60 of file itkNarrowBand.h. Definition at line 49 of file itkNarrowBand.h. Definition at line 151 of file itkNarrowBand.h. Definition at line 82 of file itkNarrowBand.h. Definition at line 78 of file itkNarrowBand.h. Clear the narrow band container. Definition at line 105 of file itkNarrowBand.h. Definition at line 99 of file itkNarrowBand.h. Definition at line 90 of file itkNarrowBand.h. Definition at line 86 of file itkNarrowBand.h. Definition at line 147 of file itkNarrowBand.h. Definition at line 141 of file itkNarrowBand.h. Referenced by itk::NarrowBandImageFilterBase< TInputImage, itk::Image< TOutputPixelType,::itk::GetImageDimension< TInputImage >::ImageDimension > >::NarrowBandImageFilterBase(). Definition at line 131 of file itkNarrowBand.h. Definition at line 127 of file itkNarrowBand.h. Definition at line 117 of file itkNarrowBand.h. Reimplemented in itk::AnisotropicFourthOrderLevelSetImageFilter< TInputImage, TOutputImage >, itk::AntiAliasBinaryImageFilter< TInputImage, TOutputImage >, itk::BalloonForceFilter< TInputMesh, TOutputMesh >, itk::BayesianClassifierImageFilter< TInputVectorImage, TLabelsType, TPosteriorsPrecisionType, TPriorsPrecisionType >, itk::BayesianClassifierInitializationImageFilter< TInputImage, TProbabilityPrecisionType >, itk::BinaryMask3DMeshSource< TInputImage, TOutputMesh >, itk::BinaryMedialNodeMetric< VDimensions >, itk::BinaryMinMaxCurvatureFlowImageFilter< TInputImage, TOutputImage >, itk::BinaryPruningImageFilter< TInputImage, TOutputImage >, itk::bio::CellularAggregate< NSpaceDimension >, itk::bio::CellularAggregateBase, itk::ClassifierBase< TDataContainer >, itk::CollidingFrontsImageFilter< TInputImage, TOutputImage >, itk::CompareHistogramImageToImageMetric< TFixedImage, TMovingImage >, itk::ConnectedRegionsMeshFilter< TInputMesh, TOutputMesh >, itk::CoreAtomImageToUnaryCorrespondenceMatrixProcess< TSourceImage >, itk::CurvatureFlowImageFilter< TInputImage, TOutputImage >, itk::CurvesLevelSetFunction< TImageType, TFeatureImageType >, itk::CurvesLevelSetImageFilter< TInputImage, TFeatureImage, TOutputPixelType >, itk::DeformableMesh3DFilter< TInputMesh, TOutputMesh >, itk::DeformableSimplexMesh3DBalloonForceFilter< TInputMesh, TOutputMesh >, itk::DeformableSimplexMesh3DFilter< TInputMesh, TOutputMesh >, itk::DeformableSimplexMesh3DGradientConstraintForceFilter< TInputMesh, TOutputMesh >, itk::DemonsRegistrationFilter< TFixedImage, TMovingImage, TDeformationField >, itk::DemonsRegistrationFunction< TFixedImage, TMovingImage, TDeformationField >, itk::EuclideanDistancePointMetric< TFixedPointSet, TMovingPointSet, TDistanceMap >, itk::FastChamferDistanceImageFilter< TInputImage, TOutputImage >, itk::FastMarchingExtensionImageFilter< TLevelSet, TAuxValue, VAuxDimension, TSpeedImage >, itk::FastMarchingImageFilter< TLevelSet, TSpeedImage >, itk::FastMarchingUpwindGradientImageFilter< TLevelSet, TSpeedImage >, itk::FastSymmetricForcesDemonsRegistrationFunction< TFixedImage, TMovingImage, TDeformationField >, itk::fem::FEMRegistrationFilter< TMovingImage, TFixedImage >, itk::GeodesicActiveContourLevelSetFunction< TImageType, TFeatureImageType >, itk::GeodesicActiveContourLevelSetImageFilter< TInputImage, TFeatureImage, TOutputPixelType >, itk::GeodesicActiveContourShapePriorLevelSetFunction< TImageType, TFeatureImageType >, itk::GeodesicActiveContourShapePriorLevelSetImageFilter< TInputImage, TFeatureImage, TOutputPixelType >, itk::GradientDifferenceImageToImageMetric< TFixedImage, TMovingImage >, itk::GradientVectorFlowImageFilter< TInputImage, TOutputImage >, itk::HistogramAlgorithmBase< TInputHistogram >, itk::HistogramImageToImageMetric< TFixedImage, TMovingImage >, itk::HistogramMatchingImageFilter< TInputImage, TOutputImage, THistogramMeasurement >, itk::ImageClassifierBase< TInputImage, TClassifiedImage >, itk::ImageGaussianModelEstimator< TInputImage, TMembershipFunction, TTrainingImage >, itk::ImageKmeansModelEstimator< TInputImage, TMembershipFunction >, itk::ImageModelEstimatorBase< TInputImage, TMembershipFunction >, itk::ImageMomentsCalculator< TImage >, itk::ImagePCADecompositionCalculator< TInputImage, TBasisImage >, itk::ImagePCAShapeModelEstimator< TInputImage, TOutputImage >, itk::ImageRegistrationMethod< TFixedImage, TMovingImage >, itk::ImageShapeModelEstimatorBase< TInputImage, TOutputImage >, itk::ImageToImageMetric< TFixedImage, TMovingImage >, itk::ImageToSpatialObjectMetric< TFixedImage, TMovingSpatialObject >, itk::ImageToSpatialObjectRegistrationMethod< TFixedImage, TMovingSpatialObject >, itk::IsoContourDistanceImageFilter< TInputImage, TOutputImage >, itk::IsolatedWatershedImageFilter< TInputImage, TOutputImage >, itk::IsotropicFourthOrderLevelSetImageFilter< TInputImage, TOutputImage >, itk::KappaStatisticImageToImageMetric< TFixedImage, TMovingImage >, itk::KLMRegionGrowImageFilter< TInputImage, TOutputImage >, itk::KullbackLeiblerCompareHistogramImageToImageMetric< TFixedImage, TMovingImage >, itk::LabelVotingImageFilter< TInputImage, TOutputImage >, itk::LaplacianSegmentationLevelSetImageFilter< TInputImage, TFeatureImage, TOutputPixelType >, itk::LevelSetMotionRegistrationFilter< TFixedImage, TMovingImage, TDeformationField >, itk::LevelSetMotionRegistrationFunction< TFixedImage, TMovingImage, TDeformationField >, itk::LevelSetNeighborhoodExtractor< TLevelSet >, itk::LevelSetVelocityNeighborhoodExtractor< TLevelSet, TAuxValue, VAuxDimension >, itk::MatchCardinalityImageToImageMetric< TFixedImage, TMovingImage >, itk::MattesMutualInformationImageToImageMetric< TFixedImage, TMovingImage >, itk::MeanReciprocalSquareDifferenceImageToImageMetric< TFixedImage, TMovingImage >, itk::MeanReciprocalSquareDifferencePointSetToImageMetric< TFixedPointSet, TMovingImage >, itk::MeanSquareRegistrationFunction< TFixedImage, TMovingImage, TDeformationField >, itk::MedialNodePairCorrespondenceProcess< TSourceImage >, itk::MedialNodeTripletCorrespondenceProcess< TSourceImage >, itk::MinMaxCurvatureFlowImageFilter< TInputImage, TOutputImage >, itk::MIRegistrationFunction< TFixedImage, TMovingImage, TDeformationField >, itk::MRASlabIdentifier< TInputImage >, itk::MRFImageFilter< TInputImage, TClassifiedImage >, itk::MRIBiasFieldCorrectionFilter< TInputImage, TOutputImage, TMaskImage >, itk::MultiResolutionImageRegistrationMethod< TFixedImage, TMovingImage >, itk::MultiResolutionPDEDeformableRegistration< TFixedImage, TMovingImage, TDeformationField, TRealType >, itk::MultiResolutionPyramidImageFilter< TInputImage, TOutputImage >, itk::MutualInformationImageToImageMetric< TFixedImage, TMovingImage >, itk::NarrowBandCurvesLevelSetImageFilter< TInputImage, TFeatureImage, TOutputPixelType >, itk::NarrowBandLevelSetImageFilter< TInputImage, TFeatureImage, TOutputPixelType, TOutputImage >, itk::NarrowBandThresholdSegmentationLevelSetImageFilter< TInputImage, TFeatureImage, TOutputPixelType >, itk::NCCRegistrationFunction< TFixedImage, TMovingImage, TDeformationField >, itk::NormalizedCorrelationImageToImageMetric< TFixedImage, TMovingImage >, itk::NormalizedCorrelationPointSetToImageMetric< TFixedPointSet, TMovingImage >, itk::OrthogonalSwath2DPathFilter< TFourierSeriesPath, TSwathMeritImage >, itk::OtsuMultipleThresholdsCalculator< TInputHistogram >, itk::OtsuMultipleThresholdsImageFilter< TInputImage, TOutputImage >, itk::OtsuThresholdImageCalculator< TInputImage >, itk::OtsuThresholdImageFilter< TInputImage, TOutputImage >, itk::PDEDeformableRegistrationFilter< TFixedImage, TMovingImage, TDeformationField >, itk::PDEDeformableRegistrationFunction< TFixedImage, TMovingImage, TDeformationField >, itk::PointSetToImageMetric< TFixedPointSet, TMovingImage >, itk::PointSetToImageRegistrationMethod< TFixedPointSet, TMovingImage >, itk::PointSetToPointSetMetric< TFixedPointSet, TMovingPointSet >, itk::PointSetToPointSetRegistrationMethod< TFixedPointSet, TMovingPointSet >, itk::PointSetToSpatialObjectDemonsRegistration< TFixedPointSet, TMovingSpatialObject >, itk::RayCastInterpolateImageFunction< TInputImage, TCoordRep >, itk::RecursiveMultiResolutionPyramidImageFilter< TInputImage, TOutputImage >, itk::RegionGrowImageFilter< TInputImage, TOutputImage >, itk::RegularSphereMeshSource< TOutputMesh >, itk::ReinitializeLevelSetImageFilter< TLevelSet >, itk::RGBGibbsPriorFilter< TInputImage, TClassifiedImage >, itk::ScalarImageKmeansImageFilter< TInputImage >, itk::SegmentationLevelSetImageFilter< TInputImage, TFeatureImage, TOutputPixelType >, itk::ShapeDetectionLevelSetFunction< TImageType, TFeatureImageType >, itk::ShapeDetectionLevelSetImageFilter< TInputImage, TFeatureImage, TOutputPixelType >, itk::ShapePriorMAPCostFunction< TFeatureImage, TOutputPixel >, itk::ShapePriorMAPCostFunctionBase< TFeatureImage, TOutputPixel >, itk::ShapePriorSegmentationLevelSetFunction< TImageType, TFeatureImageType >, itk::ShapePriorSegmentationLevelSetImageFilter< TInputImage, TFeatureImage, TOutputPixelType >, itk::SimplexMeshVolumeCalculator< TInputMesh >, itk::SphereMeshSource< TOutputMesh >, itk::STAPLEImageFilter< TInputImage, TOutputImage >, itk::SymmetricForcesDemonsRegistrationFilter< TFixedImage, TMovingImage, TDeformationField >, itk::SymmetricForcesDemonsRegistrationFunction< TFixedImage, TMovingImage, TDeformationField >, itk::ThresholdMaximumConnectedComponentsImageFilter< TInputImage, TOutputImage >, itk::ThresholdSegmentationLevelSetFunction< TImageType, TFeatureImageType >, itk::ThresholdSegmentationLevelSetImageFilter< TInputImage, TFeatureImage, TOutputPixelType >, itk::UnaryMedialNodeMetric< VDimensions >, itk::UnsharpMaskLevelSetImageFilter< TInputImage, TOutputImage >, itk::VectorThresholdSegmentationLevelSetFunction< TImageType, TFeatureImageType >, itk::VectorThresholdSegmentationLevelSetImageFilter< TInputImage, TFeatureImage, TOutputPixelType >, itk::VoronoiDiagram2D< TCoordType >, itk::VoronoiDiagram2DGenerator< TCoordType >, itk::VoronoiPartitioningImageFilter< TInputImage, TOutputImage >, itk::VoronoiSegmentationImageFilter< TInputImage, TOutputImage, TBinaryPriorImage >, itk::VoronoiSegmentationImageFilterBase< TInputImage, TOutputImage, TBinaryPriorImage >, itk::VoronoiSegmentationRGBImageFilter< TInputImage, TOutputImage >, itk::watershed::Boundary< TScalarType, TDimension >, itk::watershed::BoundaryResolver< TPixelType, TDimension >, itk::watershed::EquivalenceRelabeler< TScalarType, TImageDimension >, itk::WatershedImageFilter< TInputImage >, itk::watershed::Relabeler< TScalarType, TImageDimension >, itk::watershed::Segmenter< TInputImage >, itk::watershed::SegmentTable< TScalarType >, itk::watershed::SegmentTree< TScalarType >, itk::watershed::SegmentTreeGenerator< TScalarType >, itk::AccumulateImageFilter< TInputImage, TOutputImage >, itk::AdaptiveHistogramEqualizationImageFilter< TImageType >, itk::AnisotropicDiffusionFunction< TImage >, itk::AnisotropicDiffusionImageFilter< TInputImage, TOutputImage >, itk::ApproximateSignedDistanceMapImageFilter< TInputImage, TOutputImage >, itk::BilateralImageFilter< TInputImage, TOutputImage >, itk::BinaryDilateImageFilter< TInputImage, TOutputImage, TKernel >, itk::BinaryErodeImageFilter< TInputImage, TOutputImage, TKernel >, itk::BinaryMaskToNarrowBandPointSetFilter< TInputImage, TOutputMesh >, itk::BinaryMedianImageFilter< TInputImage, TOutputImage >, itk::BinaryMorphologyImageFilter< TInputImage, TOutputImage, TKernel >, itk::BinaryProjectionImageFilter< TInputImage, TOutputImage >, itk::BinaryThresholdImageFilter< TInputImage, TOutputImage >, itk::BinaryThresholdProjectionImageFilter< TInputImage, TOutputImage >, itk::BinomialBlurImageFilter< TInputImage, TOutputImage >, itk::BlackTopHatImageFilter< TInputImage, TOutputImage, TKernel >, itk::BloxBoundaryPointImageToBloxBoundaryProfileImageFilter< TSourceImage >, itk::BloxBoundaryPointToCoreAtomImageFilter< dim >, itk::BloxBoundaryProfileImageToBloxCoreAtomImageFilter< TInputImage, TOutputImage, TSourceImage >, itk::BSplineCenteredL2ResampleImageFilterBase< TInputImage, TOutputImage >, itk::BSplineCenteredResampleImageFilterBase< TInputImage, TOutputImage >, itk::BSplineDecompositionImageFilter< TInputImage, TOutputImage >, itk::BSplineInterpolateImageFunction< TImageType, TCoordRep, TCoefficientType >, itk::BSplineL2ResampleImageFilterBase< TInputImage, TOutputImage >, itk::BSplineResampleImageFilterBase< TInputImage, TOutputImage >, itk::CannyEdgeDetectionImageFilter< TInputImage, TOutputImage >, itk::ChainCodeToFourierSeriesPathFilter< TInputChainCodePath, TOutputFourierSeriesPath >, itk::ChangeInformationImageFilter< TInputImage >, itk::ChangeLabelImageFilter< TInputImage, TOutputImage >, itk::CheckerBoardImageFilter< TImage >, itk::ClosingByReconstructionImageFilter< TInputImage, TOutputImage, TKernel >, itk::ConfidenceConnectedImageFilter< TInputImage, TOutputImage >, itk::ConnectedComponentImageFilter< TInputImage, TOutputImage, TMaskImage >, itk::ConnectedThresholdImageFilter< TInputImage, TOutputImage >, itk::ConstantPadImageFilter< TInputImage, TOutputImage >, itk::ContourDirectedMeanDistanceImageFilter< TInputImage1, TInputImage2 >, itk::ContourMeanDistanceImageFilter< TInputImage1, TInputImage2 >, itk::CropImageFilter< TInputImage, TOutputImage >, itk::DanielssonDistanceMapImageFilter< TInputImage, TOutputImage >, itk::DeformationFieldJacobianDeterminantFilter< TInputImage, TRealType, TOutputImage >, itk::DeformationFieldSource< TOutputImage >, itk::DerivativeImageFilter< TInputImage, TOutputImage >, itk::DifferenceOfGaussiansGradientImageFilter< TInputImage, TDataType >, itk::DiffusionTensor3DReconstructionImageFilter< TReferenceImagePixelType, TGradientImagePixelType, TTensorPixelType >, itk::DilateObjectMorphologyImageFilter< TInputImage, TOutputImage, TKernel >, itk::DirectedHausdorffDistanceImageFilter< TInputImage1, TInputImage2 >, itk::DiscreteGaussianImageFilter< TInputImage, TOutputImage >, itk::DisplacementFieldJacobianDeterminantFilter< TInputImage, TRealType, TOutputImage >, itk::DoubleThresholdImageFilter< TInputImage, TOutputImage >, itk::ErodeObjectMorphologyImageFilter< TInputImage, TOutputImage, TKernel >, itk::ExpandImageFilter< TInputImage, TOutputImage >, itk::ExtractImageFilter< TInputImage, TOutputImage >, itk::ExtractOrthogonalSwath2DImageFilter< TImage >, itk::FlipImageFilter< TImage >, itk::GaussianImageSource< TOutputImage >, itk::GetAverageSliceImageFilter< TInputImage, TOutputImage >, itk::GradientImageFilter< TInputImage, TOperatorValueType, TOutputValueType >, itk::GradientImageToBloxBoundaryPointImageFilter< TInputImage >, itk::GradientMagnitudeImageFilter< TInputImage, TOutputImage >, itk::GradientMagnitudeRecursiveGaussianImageFilter< TInputImage, TOutputImage >, itk::GradientRecursiveGaussianImageFilter< TInputImage, TOutputImage >, itk::GrayscaleConnectedClosingImageFilter< TInputImage, TOutputImage >, itk::GrayscaleConnectedOpeningImageFilter< TInputImage, TOutputImage >, itk::GrayscaleFillholeImageFilter< TInputImage, TOutputImage >, itk::GrayscaleGeodesicDilateImageFilter< TInputImage, TOutputImage >, itk::GrayscaleGeodesicErodeImageFilter< TInputImage, TOutputImage >, itk::GrayscaleGrindPeakImageFilter< TInputImage, TOutputImage >, itk::GrayscaleMorphologicalClosingImageFilter< TInputImage, TOutputImage, TKernel >, itk::GrayscaleMorphologicalOpeningImageFilter< TInputImage, TOutputImage, TKernel >, itk::HausdorffDistanceImageFilter< TInputImage1, TInputImage2 >, itk::HConcaveImageFilter< TInputImage, TOutputImage >, itk::HConvexImageFilter< TInputImage, TOutputImage >, itk::Hessian3DToVesselnessMeasureImageFilter< TPixel >, itk::HessianRecursiveGaussianImageFilter< TInputImage, TOutputImage >, itk::HMaximaImageFilter< TInputImage, TOutputImage >, itk::HMinimaImageFilter< TInputImage, TOutputImage >, itk::HoughTransform2DCirclesImageFilter< TInputPixelType, TOutputPixelType >, itk::HoughTransform2DLinesImageFilter< TInputPixelType, TOutputPixelType >, itk::ImageToParametricSpaceFilter< TInputImage, TOutputMesh >, itk::ImageToVectorImageFilter< TInputImage >, itk::ImplicitManifoldNormalVectorFilter< TInputImage, TSparseOutputImage >, itk::ImportImageFilter< TPixel, VImageDimension >, itk::IntensityWindowingImageFilter< TInputImage, TOutputImage >, itk::InteriorExteriorMeshFilter< TInputMesh, TOutputMesh, TSpatialFunction >, itk::InterpolateImageFilter< TInputImage, TOutputImage >, itk::InterpolateImagePointsFilter< TInputImage, TOutputImage, TCoordType, InterpolatorType >, itk::InverseDeformationFieldImageFilter< TInputImage, TOutputImage >, itk::InvertIntensityImageFilter< TInputImage, TOutputImage >, itk::IsolatedConnectedImageFilter< TInputImage, TOutputImage >, itk::IterativeInverseDeformationFieldImageFilter< TInputImage, TOutputImage >, itk::JoinSeriesImageFilter< TInputImage, TOutputImage >, itk::LabelStatisticsImageFilter< TInputImage, TLabelImage >, itk::LaplacianImageFilter< TInputImage, TOutputImage >, itk::LaplacianRecursiveGaussianImageFilter< TInputImage, TOutputImage >, itk::LaplacianSharpeningImageFilter< TInputImage, TOutputImage >, itk::LevelSetFunctionWithRefitTerm< TImageType, TSparseImageType >, itk::MaskImageFilter< TInputImage, TMaskImage, TOutputImage >, itk::MaskNeighborhoodOperatorImageFilter< TInputImage, TMaskImage, TOutputImage, TOperatorValueType >, itk::MeanImageFilter< TInputImage, TOutputImage >, itk::MedianImageFilter< TInputImage, TOutputImage >, itk::MinimumMaximumImageCalculator< TInputImage >, itk::MinimumMaximumImageFilter< TInputImage >, itk::ModulusImageFilter< TInputImage, TOutputImage >, itk::MorphologicalGradientImageFilter< TInputImage, TOutputImage, TKernel >, itk::MorphologyImageFilter< TInputImage, TOutputImage, TKernel >, itk::NarrowBandImageFilterBase< TInputImage, TOutputImage >, itk::NeighborhoodConnectedImageFilter< TInputImage, TOutputImage >, itk::NeighborhoodOperatorImageFilter< TInputImage, TOutputImage, TOperatorValueType >, itk::NoiseImageFilter< TInputImage, TOutputImage >, itk::NonThreadedShrinkImageFilter< TInputImage, TOutputImage >, itk::NormalizedCorrelationImageFilter< TInputImage, TMaskImage, TOutputImage, TOperatorValueType >, itk::NormalVectorDiffusionFunction< TSparseImageType >, itk::NormalVectorFunctionBase< TSparseImageType >, itk::ObjectMorphologyImageFilter< TInputImage, TOutputImage, TKernel >, itk::OpeningByReconstructionImageFilter< TInputImage, TOutputImage, TKernel >, itk::OrientImageFilter< TInputImage, TOutputImage >, itk::PadImageFilter< TInputImage, TOutputImage >, itk::ParallelSparseFieldLevelSetImageFilter< TInputImage, TOutputImage >, itk::ParametricSpaceToImageSpaceMeshFilter< TInputMesh, TOutputMesh >, itk::PasteImageFilter< TInputImage, TSourceImage, TOutputImage >, itk::PathToChainCodePathFilter< TInputPath, TOutputChainCodePath >, itk::PathToImageFilter< TInputPath, TOutputImage >, itk::PermuteAxesImageFilter< TImage >, itk::PointSetToImageFilter< TInputPointSet, TOutputImage >, itk::PolylineMaskImageFilter< TInputImage, TPolyline, TVector, TOutputImage >, itk::ProjectionImageFilter< TInputImage, TOutputImage, TAccumulator >, itk::RandomImageSource< TOutputImage >, itk::ReconstructionImageFilter< TInputImage, TOutputImage, TCompare >, itk::RecursiveGaussianImageFilter< TInputImage, TOutputImage >, itk::RecursiveSeparableImageFilter< TInputImage, TOutputImage >, itk::ReflectImageFilter< TInputImage, TOutputImage >, itk::RegionOfInterestImageFilter< TInputImage, TOutputImage >, itk::RelabelComponentImageFilter< TInputImage, TOutputImage >, itk::ResampleImageFilter< TInputImage, TOutputImage, TInterpolatorPrecisionType >, itk::RescaleIntensityImageFilter< TInputImage, TOutputImage >, itk::ShiftScaleImageFilter< TInputImage, TOutputImage >, itk::ShiftScaleInPlaceImageFilter< TInputImage >, itk::ShrinkImageFilter< TInputImage, TOutputImage >, itk::SignedDanielssonDistanceMapImageFilter< TInputImage, TOutputImage >, itk::SignedMaurerDistanceMapImageFilter< TInputImage, TOutputImage >, itk::SimilarityIndexImageFilter< TInputImage1, TInputImage2 >, itk::SimpleContourExtractorImageFilter< TInputImage, TOutputImage >, itk::SimplexMeshAdaptTopologyFilter< TInputMesh, TOutputMesh >, itk::SimplexMeshToTriangleMeshFilter< TInputMesh, TOutputMesh >, itk::SmoothingRecursiveGaussianImageFilter< TInputImage, TOutputImage >, itk::SobelEdgeDetectionImageFilter< TInputImage, TOutputImage >, itk::SparseFieldFourthOrderLevelSetImageFilter< TInputImage, TOutputImage >, itk::SparseFieldLayer< TNodeType >, itk::SparseFieldLevelSetImageFilter< TInputImage, TOutputImage >, itk::SpatialObjectToImageFilter< TInputSpatialObject, TOutputImage >, itk::SpatialObjectToImageStatisticsCalculator< TInputImage, TInputSpatialObject, TSampleDimension >, itk::SpatialObjectToPointSetFilter< TInputSpatialObject, TOutputPointSet >, itk::StatisticsImageFilter< TInputImage >, itk::StreamingImageFilter< TInputImage, TOutputImage >, itk::SymmetricEigenAnalysisImageFilter< TInputImage, TOutputImage >, itk::TensorFractionalAnisotropyImageFilter< TInputImage, TOutputImage >, itk::TensorRelativeAnisotropyImageFilter< TInputImage, TOutputImage >, itk::ThresholdImageFilter< TImage >, itk::ThresholdLabelerImageFilter< TInputImage, TOutputImage >, itk::TileImageFilter< TInputImage, TOutputImage >, itk::TobogganImageFilter< TInputImage >, itk::TransformMeshFilter< TInputMesh, TOutputMesh, TTransform >, itk::TriangleMeshToBinaryImageFilter< TInputMesh, TOutputImage >, itk::TriangleMeshToSimplexMeshFilter< TInputMesh, TOutputMesh >, itk::TwoOutputExampleImageFilter< TImage >, itk::VectorAnisotropicDiffusionFunction< TImage >, itk::VectorConfidenceConnectedImageFilter< TInputImage, TOutputImage >, itk::VectorCurvatureNDAnisotropicDiffusionFunction< TImage >, itk::VectorExpandImageFilter< TInputImage, TOutputImage >, itk::VectorGradientMagnitudeImageFilter< TInputImage, TRealType, TOutputImage >, itk::VectorNeighborhoodOperatorImageFilter< TInputImage, TOutputImage >, itk::VectorResampleImageFilter< TInputImage, TOutputImage, TInterpolatorPrecisionType >, itk::VectorRescaleIntensityImageFilter< TInputImage, TOutputImage >, itk::VotingBinaryHoleFillingImageFilter< TInputImage, TOutputImage >, itk::VotingBinaryImageFilter< TInputImage, TOutputImage >, itk::VotingBinaryIterativeHoleFillingImageFilter< TImage >, itk::VTKImageExport< TInputImage >, itk::VTKImageExportBase, itk::VTKImageImport< TOutputImage >, itk::WarpImageFilter< TInputImage, TOutputImage, TDeformationField >, itk::WarpMeshFilter< TInputMesh, TOutputMesh, TDeformationField >, itk::WarpVectorImageFilter< TInputImage, TOutputImage, TDeformationField >, itk::WhiteTopHatImageFilter< TInputImage, TOutputImage, TKernel >, itk::ZeroCrossingBasedEdgeDetectionImageFilter< TInputImage, TOutputImage >, itk::ZeroCrossingImageFilter< TInputImage, TOutputImage >, itk::AffineTransform< TScalarType, NDimensions >, itk::AutoPointerDataObjectDecorator< T >, itk::AzimuthElevationToCartesianTransform< TScalarType, NDimensions >, itk::BinaryThresholdImageFunction< TInputImage, TCoordRep >, itk::BinaryThresholdSpatialFunction< TFunction >, itk::BloxBoundaryPointImage< TImageDimension >, itk::BloxBoundaryProfileImage< TImageDimension >, itk::BloxCoreAtomImage< NDimension >, itk::BloxImage< TBloxPixelType, TImageDimension >, itk::BoundingBox< TPointIdentifier, VPointDimension, TCoordRep, TPointsContainer >, itk::BSplineDeformableTransform< TScalarType, NDimensions, VSplineOrder >, itk::BSplineDerivativeKernelFunction< VSplineOrder >, itk::BSplineInterpolationWeightFunction< TCoordRep, VSpaceDimension, VSplineOrder >, itk::BSplineKernelFunction< VSplineOrder >, itk::CenteredEuler3DTransform< TScalarType >, itk::CenteredRigid2DTransform< TScalarType >, itk::CenteredSimilarity2DTransform< TScalarType >, itk::CenteredTransformInitializer< TTransform, TFixedImage, TMovingImage >, itk::CenteredVersorTransformInitializer< TFixedImage, TMovingImage >, itk::CentralDifferenceImageFunction< TInputImage, TCoordRep >, itk::ChainCodePath< VDimension >, itk::ChainCodePath2D, itk::ColorTable< TPixel >, itk::ConicShellInteriorExteriorSpatialFunction< VDimension, TInput >, itk::CoreAtomImageToDistanceMatrixProcess< TSourceImage >, itk::CovarianceImageFunction< TInputImage, TCoordRep >, itk::DataObject, itk::DataObjectDecorator< T >, itk::DecisionRuleBase, itk::DenseFiniteDifferenceImageFilter< TInputImage, TOutputImage >, itk::DifferenceImageFilter< TInputImage, TOutputImage >, itk::Directory, itk::ElasticBodyReciprocalSplineKernelTransform< TScalarType, NDimensions >, itk::ElasticBodySplineKernelTransform< TScalarType, NDimensions >, itk::EllipsoidInteriorExteriorSpatialFunction< VDimension, TInput >, itk::EquivalencyTable, itk::Euler2DTransform< TScalarType >, itk::Euler3DTransform< TScalarType >, itk::ExtrapolateImageFunction< TInputImage, TCoordRep >, itk::FastMutexLock, itk::FileOutputWindow, itk::FiniteCylinderSpatialFunction< VDimension, TInput >, itk::FiniteDifferenceFunction< TImageType >, itk::FiniteDifferenceImageFilter< TInputImage, TOutputImage >, itk::FiniteDifferenceSparseImageFilter< TInputImageType, TSparseOutputImageType >, itk::FiniteDifferenceSparseImageFunction< TSparseImageType >, itk::FourierSeriesPath< VDimension >, itk::FrustumSpatialFunction< VImageDimension, TInput >, itk::GaussianBlurImageFunction< TInputImage, TOutput >, itk::GaussianDerivativeImageFunction< TInputImage, TOutput >, itk::GaussianDerivativeSpatialFunction< TOutput, VImageDimension, TInput >, itk::GaussianKernelFunction, itk::GaussianSpatialFunction< TOutput, VImageDimension, TInput >, itk::Image< TPixel, VImageDimension >, itk::ImageAdaptor< TImage, TAccessor >, itk::ImageAndPathToImageFilter< TInputImage, TInputPath, TOutputImage >, itk::ImageBase< VImageDimension >, itk::ImageDuplicator< TInputImage >, itk::ImageFunction< TInputImage, TOutput, TCoordRep >, itk::ImageRegionMultidimensionalSplitter< VImageDimension >, itk::ImageRegionSplitter< VImageDimension >, itk::ImageToImageFilter< TInputImage, TOutputImage >, itk::ImportImageContainer< TElementIdentifier, TElement >, itk::InPlaceImageFilter< TInputImage, TOutputImage >, itk::InteriorExteriorSpatialFunction< VDimension, TInput >, itk::InterpolateImageFunction< TInputImage, TCoordRep >, itk::KernelFunction, itk::KernelTransform< TScalarType, NDimensions >, itk::KLMSegmentationBorder, itk::KLMSegmentationRegion, itk::LandmarkBasedTransformInitializer< TTransform, TFixedImage, TMovingImage >, itk::LevelSetFunction< TImageType >, itk::LightProcessObject, itk::LinearInterpolateImageFunction< TInputImage, TCoordRep >, itk::LoggerBase, itk::LoggerManager, itk::LoggerOutput, itk::MahalanobisDistanceThresholdImageFunction< TInputImage, TCoordRep >, itk::MatrixOffsetTransformBase< TScalarType, NInputDimensions, NOutputDimensions >, itk::MaximumDecisionRule, itk::MeanImageFunction< TInputImage, TCoordRep >, itk::MedianImageFunction< TInputImage, TCoordRep >, itk::Statistics::MersenneTwisterRandomVariateGenerator, itk::Mesh< TPixelType, VDimension, TMeshTraits >, itk::MeshSource< TOutputMesh >, itk::MultiThreader, itk::MutexLock, itk::NearestNeighborExtrapolateImageFunction< TInputImage, TCoordRep >, itk::NearestNeighborInterpolateImageFunction< TInputImage, TCoordRep >, itk::NeighborhoodBinaryThresholdImageFunction< TInputImage, TCoordRep >, itk::NeighborhoodOperatorImageFunction< TInputImage, TOutput >, itk::NonUniformBSpline< TDimension >, itk::Object, itk::ObjectFactoryBase, itk::ObjectStore< TObjectType >, itk::OneWayEquivalencyTable, itk::OrthogonallyCorrected2DParametricPath, itk::OutputWindow, itk::ParametricPath< VDimension >, itk::Path< TInput, TOutput, VDimension >, itk::PathAndImageToPathFilter< TInputPath, TInputImage, TOutputPath >, itk::PathSource< TOutputPath >, itk::PathToPathFilter< TInputPath, TOutputPath >, itk::PCAShapeSignedDistanceFunction< TCoordRep, VSpaceDimension, TImage >, itk::PhasedArray3DSpecialCoordinatesImage< TPixel >, itk::PointLocator< TPointIdentifier, VPointDimension, TCoordRep, TPointsContainer >, itk::PointSet< TPixelType, VDimension, TMeshTraits >, itk::PolyLineParametricPath< VDimension >, itk::ProcessObject, itk::ProgressAccumulator, itk::QuaternionRigidTransform< TScalarType >, itk::RealTimeClock, itk::Rigid2DTransform< TScalarType >, itk::Rigid3DPerspectiveTransform< TScalarType >, itk::Rigid3DTransform< TScalarType >, itk::ScalableAffineTransform< TScalarType, NDimensions >, itk::ScaleLogarithmicTransform< TScalarType, NDimensions >, itk::ScaleSkewVersor3DTransform< TScalarType >, itk::ScaleTransform< TScalarType, NDimensions >, itk::ScatterMatrixImageFunction< TInputImage, TCoordRep >, itk::SegmentationBorder, itk::SegmentationRegion, itk::ShapeSignedDistanceFunction< TCoordRep, VSpaceDimension >, itk::Similarity2DTransform< TScalarType >, itk::Similarity3DTransform< TScalarType >, itk::SimpleDataObjectDecorator< T >, itk::SimplexMesh< TPixelType, VDimension, TMeshTraits >, itk::SparseImage< TNode, VImageDimension >, itk::SpatialFunction< TOutput, VImageDimension, TInput >, itk::SpecialCoordinatesImage< TPixel, VImageDimension >, itk::SphereSignedDistanceFunction< TCoordRep, VSpaceDimension >, itk::SphereSpatialFunction< VImageDimension, TInput >, itk::StdStreamLogOutput, itk::SumOfSquaresImageFunction< TInputImage, TCoordRep >, itk::SymmetricEllipsoidInteriorExteriorSpatialFunction< VDimension, TInput >, itk::ThreadLogger, itk::TorusInteriorExteriorSpatialFunction< VDimension, TInput >, itk::TranslationTransform< TScalarType, NDimensions >, itk::TreeContainer< TValueType >, itk::ValarrayImageContainer< TElementIdentifier, TElement >, itk::VarianceImageFunction< TInputImage, TCoordRep >, itk::VectorImage< TPixel, VImageDimension >, itk::VectorInterpolateImageFunction< TInputImage, TCoordRep >, itk::VectorLinearInterpolateImageFunction< TInputImage, TCoordRep >, itk::VectorMeanImageFunction< TInputImage, TCoordRep >, itk::VectorNearestNeighborInterpolateImageFunction< TInputImage, TCoordRep >, itk::VersorRigid3DTransform< TScalarType >, itk::VersorTransform< TScalarType >, itk::WindowedSincInterpolateImageFunction< TInputImage, VRadius, TWindowFunction, TBoundaryCondition, TCoordRep >, itk::XMLFileOutputWindow, itk::AnalyzeImageIO, itk::AnalyzeImageIOFactory, itk::ArchetypeSeriesFileNames, itk::BioRadImageIO, itk::BMPImageIO, itk::Brains2MaskImageIO, itk::DICOMImageIO2, itk::DICOMSeriesFileNames, itk::GDCMImageIO, itk::GDCMSeriesFileNames, itk::GE4ImageIOFactory, itk::GE5ImageIOFactory, itk::GEAdwImageIOFactory, itk::GiplImageIO, itk::ImageFileReader< TOutputImage, ConvertPixelTraits >, itk::ImageFileWriter< TInputImage >, itk::ImageIOBase, itk::ImageSeriesReader< TOutputImage >, itk::ImageSeriesWriter< TInputImage, TOutputImage >, itk::IPLCommonImageIO, itk::JPEGImageIO, itk::LSMImageIO, itk::MetaImageIO, itk::NiftiImageIO, itk::NiftiImageIOFactory, itk::NrrdImageIO, itk::NumericSeriesFileNames, itk::PNGImageIO, itk::RawImageIO< TPixel, VImageDimension >, itk::RegularExpressionSeriesFileNames, itk::SiemensVisionImageIOFactory, itk::StimulateImageIO, itk::TIFFImageIO, itk::VTKImageIO, itk::AmoebaOptimizer, itk::CostFunction, itk::CumulativeGaussianCostFunction, itk::CumulativeGaussianOptimizer, itk::ExhaustiveOptimizer, itk::FRPROptimizer, itk::GradientDescentOptimizer, itk::LBFGSBOptimizer, itk::LBFGSOptimizer, itk::MultipleValuedNonLinearOptimizer, itk::MultipleValuedNonLinearVnlOptimizer, itk::OnePlusOneEvolutionaryOptimizer, itk::Optimizer, itk::PowellOptimizer, itk::RegularStepGradientDescentBaseOptimizer, itk::SingleValuedNonLinearOptimizer, itk::SingleValuedNonLinearVnlOptimizer, itk::SPSAOptimizer, itk::SymmetricEigenSystem< TMatrixElement, VNumberOfRows >, itk::Statistics::BackPropagationLayer< TMeasurementVector, TTargetVector >, itk::Statistics::BatchSupervisedTrainingFunction< TSample, TTargetVector, ScalarType >, itk::Statistics::CompletelyConnectedWeightSet< TMeasurementVector, TTargetVector >, itk::Statistics::ErrorBackPropagationLearningFunctionBase< LayerType, TTargetVector >, itk::Statistics::ErrorBackPropagationLearningWithMomentum< LayerType, TTargetVector >, itk::Statistics::GaussianRadialBasisFunction< ScalarType >, itk::Statistics::GaussianTransferFunction< ScalarType >, itk::Statistics::HardLimitTransferFunction< ScalarType >, itk::Statistics::IdentityTransferFunction< ScalarType >, itk::Statistics::InputFunctionBase< TMeasurementVector, TTargetVector >, itk::Statistics::IterativeSupervisedTrainingFunction< TSample, TTargetVector, ScalarType >, itk::Statistics::LayerBase< TMeasurementVector, TTargetVector >, itk::Statistics::LearningFunctionBase< LayerType, TTargetVector >, itk::Statistics::LogSigmoidTransferFunction< ScalarType >, itk::Statistics::MeanSquaredErrorFunction< TMeasurementVector, ScalarType >, itk::Statistics::MultilayerNeuralNetworkBase< TMeasurementVector, TTargetVector, TLearningLayer >, itk::Statistics::MultiquadricRadialBasisFunction< ScalarType >, itk::Statistics::NeuralNetworkObject< TMeasurementVector, TTargetVector >, itk::Statistics::NNetDistanceMetricBase< TMeasurementVector >, itk::Statistics::OneHiddenLayerBackPropagationNeuralNetwork< TMeasurementVector, TTargetVector >, itk::Statistics::ProductInputFunction< TMeasurementVector, ScalarType >, itk::Statistics::QuickPropLearningRule< LayerType, TTargetVector >, itk::Statistics::RadialBasisFunctionBase< ScalarType >, itk::Statistics::RBFBackPropagationLearningFunction< LayerType, TTargetVector >, itk::Statistics::RBFLayer< TMeasurementVector, TTargetVector >, itk::Statistics::RBFNetwork< TMeasurementVector, TTargetVector >, itk::Statistics::SigmoidTransferFunction< ScalarType >, itk::Statistics::SignedHardLimitTransferFunction< ScalarType >, itk::Statistics::SquaredDifferenceErrorFunction< TMeasurementVector, ScalarType >, itk::Statistics::SumInputFunction< TMeasurementVector, ScalarType >, itk::Statistics::SymmetricSigmoidTransferFunction< ScalarType >, itk::Statistics::TanHTransferFunction< ScalarType >, itk::Statistics::TanSigmoidTransferFunction< ScalarType >, itk::Statistics::TrainingFunctionBase< TSample, TTargetVector, ScalarType >, itk::Statistics::TransferFunctionBase< ScalarType >, itk::Statistics::TwoHiddenLayerBackPropagationNeuralNetwork< TMeasurementVector, TTargetVector >, itk::Statistics::WeightSetBase< TMeasurementVector, TTargetVector >, itk::Statistics::ChiSquareDistribution, itk::Statistics::DenseFrequencyContainer, itk::Statistics::DensityFunction< TMeasurementVector >, itk::Statistics::DistanceMetric< TVector >, itk::Statistics::DistanceToCentroidMembershipFunction< TVector >, itk::Statistics::ExpectationMaximizationMixtureModelEstimator< TSample >, itk::Statistics::GaussianDensityFunction< TMeasurementVector >, itk::Statistics::GaussianDistribution, itk::Statistics::GaussianGoodnessOfFitComponent< TInputSample >, itk::Statistics::GaussianMixtureModelComponent< TSample >, itk::Statistics::GoodnessOfFitComponentBase< TInputSample >, itk::Statistics::GoodnessOfFitFunctionBase< TInputHistogram >, itk::Statistics::GoodnessOfFitMixtureModelCostFunction< TInputSample >, itk::Statistics::GreyLevelCooccurrenceMatrixTextureCoefficientsCalculator< THistogram >, itk::Statistics::Histogram< TMeasurement, VMeasurementVectorSize, TFrequencyContainer >, itk::HistogramToImageFilter< THistogram, TFunction >, itk::Statistics::HypersphereKernelMeanShiftModeSeeker< TSample >, itk::Statistics::ImageToCooccurrenceListAdaptor< TImage >, itk::Statistics::ImageToHistogramGenerator< TImageType >, itk::Statistics::ImageToListAdaptor< TImage, TMeasurementVector >, itk::Statistics::ImageToListGenerator< TImage, TMaskImage >, itk::Statistics::JointDomainImageToListAdaptor< TImage >, itk::Statistics::KdTree< TSample >, itk::Statistics::KdTreeBasedKmeansEstimator< TKdTree >, itk::Statistics::KdTreeGenerator< TSample >, itk::Statistics::ListSample< TMeasurementVector >, itk::Statistics::ListSampleBase< TMeasurementVector >, itk::Statistics::ListSampleToHistogramGenerator< TListSample, THistogramMeasurement, TFrequencyContainer, TMeasurementVectorLength >, itk::Statistics::MahalanobisDistanceMembershipFunction< TVector >, itk::Statistics::MaskedScalarImageToGreyLevelCooccurrenceMatrixGenerator< TImageType, THistogramFrequencyContainer >, itk::Statistics::MeanCalculator< TSample >, itk::Statistics::MeanShiftModeCacheMethod< TMeasurementVector >, itk::Statistics::MeanShiftModeSeekerBase< TSample >, itk::Statistics::MembershipFunctionBase< TVector >, itk::Statistics::MembershipSample< TSample >, itk::Statistics::MembershipSampleGenerator< TInputSample, TClassMaskSample >, itk::Statistics::MixtureModelComponentBase< TSample >, itk::Statistics::NeighborhoodSampler< TSample >, itk::Statistics::NormalVariateGenerator, itk::Statistics::PointSetToListAdaptor< TPointSet >, itk::Statistics::ProbabilityDistribution, itk::Statistics::Sample< TMeasurementVector >, itk::Statistics::SampleAlgorithmBase< TInputSample >, itk::Statistics::SampleClassifier< TSample >, itk::Statistics::SampleClassifierWithMask< TSample, TMaskSample >, itk::Statistics::SampleMeanShiftBlurringFilter< TSample >, itk::Statistics::SampleMeanShiftClusteringFilter< TSample >, itk::Statistics::SampleSelectiveMeanShiftBlurringFilter< TSample >, itk::Statistics::SampleToHistogramProjectionFilter< TInputSample, THistogramMeasurement >, itk::Statistics::ScalarImageTextureCalculator< TImageType, THistogramFrequencyContainer >, itk::Statistics::ScalarImageToGreyLevelCooccurrenceMatrixGenerator< TImageType, THistogramFrequencyContainer >, itk::Statistics::ScalarImageToHistogramGenerator< TImageType >, itk::Statistics::ScalarImageToListAdaptor< TImage >, itk::Statistics::SelectiveSubsampleGenerator< TInputSample, TClassMaskSample >, itk::Statistics::SparseFrequencyContainer, itk::Statistics::Subsample< TSample >, itk::Statistics::TDistribution, itk::Statistics::VariableDimensionHistogram< TMeasurement, TFrequencyContainer >, itk::Statistics::WeightedCentroidKdTreeGenerator< TSample >, itk::Statistics::WeightedCovarianceCalculator< TSample >, itk::Statistics::WeightedMeanCalculator< TSample >, itk::ActiveShapeModelCalculator< TImage >, itk::ActiveShapeModelGradientSearchMethod< TImage >, itk::SimpleFuzzyConnectednessImageFilterBase< TInputImage, TOutputImage >, itk::SimpleFuzzyConnectednessRGBImageFilter< TInputImage, TOutputImage >, itk::SimpleFuzzyConnectednessScalarImageFilter< TInputImage, TOutputImage >, itk::VectorFuzzyConnectednessImageFilter< TInputImage, TOutputImage >, itk::AddConstantToImageFilter< TInputImage, TConstant, TOutputImage >, itk::AnchorCloseImageFilter< TImage, TKernel >, itk::AnchorDilateImageFilter< TImage, TKernel >, itk::AnchorErodeDilateImageFilter< TImage, TKernel, TFunction1, TFunction2 >, itk::AnchorErodeImageFilter< TImage, TKernel >, itk::AnchorOpenCloseImageFilter< TImage, TKernel, LessThan, GreaterThan, LessEqual, GreaterEqual >, itk::AnchorOpenImageFilter< TImage, TKernel >, itk::BinaryMorphologicalClosingImageFilter< TInputImage, TOutputImage, TKernel >, itk::BinaryMorphologicalOpeningImageFilter< TInputImage, TOutputImage, TKernel >, itk::BoxImageFilter< TInputImage, TOutputImage >, itk::Bruker2DSEQImageIO, itk::BSplineScatteredDataPointSetToImageFilter< TInputPointSet, TOutputImage >, itk::ConformalFlatteningMeshFilter< TInputMesh, TOutputMesh >, itk::ContourExtractor2DImageFilter< TInputImage >, itk::CoxDeBoorBSplineKernelFunction< VSplineOrder >, itk::DiffeomorphicDemonsRegistrationFilter< TFixedImage, TMovingImage, TDeformationField >, itk::DiscreteGaussianDerivativeImageFilter< TInputImage, TOutputImage >, itk::DiscreteGaussianDerivativeImageFunction< TInputImage, TOutput >, itk::DiscreteGradientMagnitudeGaussianImageFunction< TInputImage, TOutput >, itk::DiscreteHessianGaussianImageFunction< TInputImage, TOutput >, itk::DivideByConstantImageFilter< TInputImage, TConstant, TOutputImage >, itk::ESMDemonsRegistrationFunction< TFixedImage, TMovingImage, TDeformationField >, itk::ExponentialDeformationFieldImageFilter< TInputImage, TOutputImage >, itk::FastApproximateRankImageFilter< TInputImage, TOutputImage >, itk::FastSymmetricForcesDemonsRegistrationFilter< TFixedImage, TMovingImage, TDeformationField >, itk::GridForwardWarpImageFilter< TDeformationField, TOutputImage >, itk::ImageToPathFilter< TInputImage, TOutputPath >, itk::KappaSigmaThresholdImageCalculator< TInputImage, TMaskImage >, itk::KappaSigmaThresholdImageFilter< TInputImage, TMaskImage, TOutputImage >, itk::KernelImageFilter< TInputImage, TOutputImage, TKernel >, itk::LabelOverlayImageFilter< TInputImage, TLabelImage, TOutputImage >, itk::LabelToRGBImageFilter< TLabelImage, TOutputImage >, itk::MaskedMovingHistogramImageFilter< TInputImage, TMaskImage, TOutputImage, TKernel, THistogram >, itk::MaskedRankImageFilter< TInputImage, TMaskImage, TOutputImage, TKernel >, itk::MatlabTransformIOFactory, itk::MINC2ImageIO, itk::MorphologicalWatershedFromMarkersImageFilter< TInputImage, TLabelImage >, itk::MorphologicalWatershedImageFilter< TInputImage, TOutputImage >, itk::MovingHistogramImageFilterBase< TInputImage, TOutputImage, TKernel >, itk::MovingHistogramMorphologyImageFilter< TInputImage, TOutputImage, TKernel, THistogram >, itk::MultiplyByConstantImageFilter< TInputImage, TConstant, TOutputImage >, itk::NeuralNetworkFileReader< TNetwork >, itk::NeuralNetworkFileWriter< TNetwork >, itk::AdaptiveHistogramEqualizationImageFilter< TImageType >, itk::BinaryMorphologyImageFilter< TInputImage, TOutputImage, TKernel >, itk::BlackTopHatImageFilter< TInputImage, TOutputImage, TKernel >, itk::BSplineInterpolateImageFunction< TImageType, TCoordRep, TCoefficientType >, itk::GrayscaleDilateImageFilter< TInputImage, TOutputImage, TKernel >, itk::GrayscaleErodeImageFilter< TInputImage, TOutputImage, TKernel >, itk::GrayscaleMorphologicalClosingImageFilter< TInputImage, TOutputImage, TKernel >, itk::GrayscaleMorphologicalOpeningImageFilter< TInputImage, TOutputImage, TKernel >, itk::ImageToImageMetric< TFixedImage, TMovingImage >, itk::LinearInterpolateImageFunction< TInputImage, TCoordRep >, itk::MatchCardinalityImageToImageMetric< TFixedImage, TMovingImage >, itk::MattesMutualInformationImageToImageMetric< TFixedImage, TMovingImage >, itk::MeanSquaresImageToImageMetric< TFixedImage, TMovingImage >, itk::MorphologicalGradientImageFilter< TInputImage, TOutputImage, TKernel >, itk::MorphologyImageFilter< TInputImage, TOutputImage, TKernel >, itk::ResampleImageFilter< TInputImage, TOutputImage, TInterpolatorPrecisionType >, itk::SimpleContourExtractorImageFilter< TInputImage, TOutputImage >, itk::WhiteTopHatImageFilter< TInputImage, TOutputImage, TKernel >, itk::PhilipsRECImageIO, itk::QuadEdgeMeshDecimationFilter< TInput, TOutput, TCriterion >, itk::QuadEdgeMeshEulerOperatorFlipEdgeFunction< TMesh, TQEType >, itk::QuadEdgeMeshEulerOperatorJoinVertexFunction< TMesh, TQEType >, itk::QuadEdgeMeshTopologyChecker< TMesh >, itk::RankImageFilter< TInputImage, TOutputImage, TKernel >, itk::RegionalMaximaImageFilter< TInputImage, TOutputImage >, itk::RegionalMinimaImageFilter< TInputImage, TOutputImage >, itk::SliceBySliceImageFilter< TInputImage, TOutputImage, TInputFilter, TOutputFilter, TInternalInputImage, TInternalOutputImage >, itk::SubtractConstantFromImageFilter< TInputImage, TConstant, TOutputImage >, itk::TransformIOBase, itk::TransformToDeformationFieldSource< TOutputImage, TTransformPrecisionType >, itk::TxtTransformIOFactory, itk::ValuedRegionalExtremaImageFilter< TInputImage, TOutputImage, TFunction1, TFunction2 >, itk::VanHerkGilWermanDilateImageFilter< TImage, TKernel >, itk::VanHerkGilWermanErodeDilateImageFilter< TImage, TKernel, TFunction1 >, itk::VanHerkGilWermanErodeImageFilter< TImage, TKernel >, itk::VectorCentralDifferenceImageFunction< TInputImage, TCoordRep >, itk::VectorLinearInterpolateNearestNeighborExtrapolateImageFunction< TInputImage, TCoordRep >, itk::VoxBoCUBImageIO, itk::VTKPolyDataReader< TOutputMesh >, itk::VTKPolyDataWriter< TInputMesh >, itk::WarpHarmonicEnergyCalculator< TInputImage >, itk::ArrowSpatialObject< TDimension >, itk::BlobSpatialObject< TDimension >, itk::BoxSpatialObject< TDimension >, itk::ContourSpatialObject< TDimension >, itk::CylinderSpatialObject, itk::DTITubeSpatialObject< TDimension >, itk::EllipseSpatialObject< TDimension >, itk::GaussianSpatialObject< TDimension >, itk::GroupSpatialObject< TDimension >, itk::ImageMaskSpatialObject< TDimension >, itk::ImageSpatialObject< TDimension, TPixelType >, itk::LandmarkSpatialObject< TDimension >, itk::LineSpatialObject< TDimension >, itk::MeshSpatialObject< TMesh >, itk::PlaneSpatialObject< TDimension >, itk::PointBasedSpatialObject< TDimension >, itk::SceneSpatialObject< TSpaceDimension >, itk::SpatialObject< TDimension >, itk::SpatialObjectDuplicator< TInputSpatialObject >, itk::SpatialObjectProperty< TComponentType >, itk::SurfaceSpatialObject< TDimension >, itk::TubeSpatialObject< TDimension, TTubePointType >, itk::VesselTubeSpatialObject< TDimension >, itk::ClassifierBase< TInputImage >, itk::ClassifierBase< TSample >, itk::NarrowBandLevelSetImageFilter< TInputImage, TFeatureImage, TOutputPixelType, itk::Image< TOutputPixelType,::itk::GetImageDimension< TInputImage >::ImageDimension > >, itk::VoronoiSegmentationImageFilterBase< TInputImage, TOutputImage >, itk::watershed::Relabeler< InputImageType::PixelType, itkGetStaticConstMacro(ImageDimension)>, itk::watershed::SegmentTreeGenerator< InputImageType::PixelType >, itk::BSplineInterpolateImageFunction< TImageType, TCoordRep, TImageType::PixelType >, itk::BSplineInterpolateImageFunction< TImageType, TCoordRep, TImageType::PixelType >, itk::CannyEdgeDetectionImageFilter< Superclass::ImageType, Superclass::ImageType >, itk::DanielssonDistanceMapImageFilter< Superclass::ImageType, Superclass::ImageType >, itk::NarrowBandImageFilterBase< TInputImage, itk::Image< TOutputPixelType,::itk::GetImageDimension< TInputImage >::ImageDimension > >, itk::ProjectionImageFilter< TInputImage, TOutputImage, itk::Function::MedianAccumulator< TInputImage::PixelType > >, itk::ProjectionImageFilter< TInputImage, TOutputImage, itk::Function::MaximumAccumulator< TInputImage::PixelType > >, itk::ProjectionImageFilter< TInputImage, TOutputImage, itk::Function::BinaryThresholdAccumulator< TInputImage::PixelType, TOutputImage::PixelType > >, itk::ProjectionImageFilter< TInputImage, TOutputImage, itk::Function::MinimumAccumulator< TInputImage::PixelType > >, itk::ProjectionImageFilter< TInputImage, TOutputImage, itk::Function::MeanAccumulator< TInputImage::PixelType, TAccumulate > >, itk::ProjectionImageFilter< TInputImage, TOutputImage, itk::Function::StandardDeviationAccumulator< TInputImage::PixelType, TAccumulate > >, itk::ProjectionImageFilter< TInputImage, TOutputImage, itk::Function::SumAccumulator< TInputImage::PixelType, TOutputImage::PixelType > >, itk::ProjectionImageFilter< TInputImage, TOutputImage, itk::Function::BinaryAccumulator< TInputImage::PixelType, TOutputImage::PixelType > >, itk::ReconstructionImageFilter< TInputImage, TOutputImage, std::greater< TOutputImage::PixelType > >, itk::ReconstructionImageFilter< TInputImage, TOutputImage, std::less< TOutputImage::PixelType > >, itk::SparseFieldLevelSetImageFilter< TInputImage, itk::Image< TOutputPixelType,::itk::GetImageDimension< TInputImage >::ImageDimension > >, itk::BloxImage< itk::BloxCoreAtomPixel< NDimension >, NDimension >, itk::BloxImage< itk::BloxBoundaryProfilePixel< TImageDimension >, TImageDimension >, itk::BloxImage< itk::BloxBoundaryPointPixel< TImageDimension >, TImageDimension >, itk::CenteredTransformInitializer< itk::VersorRigid3DTransform< double >, TFixedImage, TMovingImage >, itk::ChainCodePath< 2 >, itk::DenseFiniteDifferenceImageFilter< TDeformationField, TDeformationField >, itk::FiniteDifferenceFunction< TImage >, itk::FiniteDifferenceFunction< TDeformationField >, itk::FiniteDifferenceFunction< TSparseImageType >, itk::FiniteDifferenceImageFilter< TDeformationField, TDeformationField >, itk::FiniteDifferenceImageFilter< TInputImage, TSparseOutputImage >, itk::FiniteDifferenceImageFilter< TInputImage, itk::Image< TOutputPixelType,::itk::GetImageDimension< TInputImage >::ImageDimension > >, itk::FiniteDifferenceImageFilter< TInputImageType, TSparseOutputImageType >, itk::FiniteDifferenceSparseImageFilter< TInputImage, TSparseOutputImage >, itk::Image< itk::BloxCoreAtomPixel< NDimension >, TImageDimension >, itk::Image< TNode *, VImageDimension >, itk::Image< itk::BloxBoundaryProfilePixel< TImageDimension >, TImageDimension >, itk::Image< TBloxPixelType, TImageDimension >, itk::Image< itk::BloxBoundaryPointPixel< TImageDimension >, TImageDimension >, itk::ImageAdaptor< TImage, itk::Accessor::AsinPixelAccessor< TImage::PixelType, TOutputPixelType > >, itk::ImageAdaptor< TImage, itk::Accessor::AbsPixelAccessor< TImage::PixelType, TOutputPixelType > >, itk::ImageAdaptor< TImage, itk::Accessor::LogPixelAccessor< TImage::PixelType, TOutputPixelType > >, itk::ImageAdaptor< TImage, itk::Accessor::ComplexToPhasePixelAccessor< TImage::PixelType, TOutputPixelType > >, itk::ImageAdaptor< TImage, itk::Accessor::Log10PixelAccessor< TImage::PixelType, TOutputPixelType > >, itk::ImageAdaptor< TImage, itk::Accessor::ExpPixelAccessor< TImage::PixelType, TOutputPixelType > >, itk::ImageAdaptor< TImage, itk::Accessor::AddPixelAccessor< TImage::PixelType > >, itk::ImageAdaptor< itk::VectorImage< TPixelType, Dimension >, itk::Accessor::VectorImageToImagePixelAccessor< TPixelType > >, itk::ImageAdaptor< TImage, itk::Accessor::RGBToVectorPixelAccessor< TImage::PixelType::ComponentType > >, itk::ImageAdaptor< TImage, itk::PixelAccessor< TInternalType, TExternalType > >, itk::ImageAdaptor< TImage, itk::Accessor::SqrtPixelAccessor< TImage::PixelType, TOutputPixelType > >, itk::ImageAdaptor< TImage, itk::Accessor::AcosPixelAccessor< TImage::PixelType, TOutputPixelType > >, itk::ImageAdaptor< TImage, itk::Accessor::ComplexToModulusPixelAccessor< TImage::PixelType, TOutputPixelType > >, itk::ImageAdaptor< TImage, itk::Accessor::ExpNegativePixelAccessor< TImage::PixelType, TOutputPixelType > >, itk::ImageAdaptor< TImage, itk::Accessor::VectorToRGBPixelAccessor< TImage::PixelType::ValueType > >, itk::ImageAdaptor< TImage, itk::Accessor::TanPixelAccessor< TImage::PixelType, TOutputPixelType > >, itk::ImageAdaptor< TImage, itk::Accessor::ComplexToRealPixelAccessor< TImage::PixelType, TOutputPixelType > >, itk::ImageAdaptor< TImage, itk::Accessor::RGBToLuminancePixelAccessor< TImage::PixelType, TOutputPixelType > >, itk::ImageAdaptor< TImage, itk::Accessor::AtanPixelAccessor< TImage::PixelType, TOutputPixelType > >, itk::ImageAdaptor< TImage, itk::Accessor::SinPixelAccessor< TImage::PixelType, TOutputPixelType > >, itk::ImageAdaptor< TImage, itk::Accessor::ComplexToImaginaryPixelAccessor< TImage::PixelType, TOutputPixelType > >, itk::ImageAdaptor< TImage, itk::Accessor::CosPixelAccessor< TImage::PixelType, TOutputPixelType > >, itk::ImageAndPathToImageFilter< TImage, itk::ParametricPath< 2 >, TImage >, itk::ImageBase< ::itk::GetImageDimension< itk::VectorImage< TPixelType, Dimension > >::ImageDimension >, itk::ImageBase< ::itk::GetImageDimension< TImage >::ImageDimension >, itk::ImageFunction< TInputImage, itk::Vector< TOutput,::itk::GetImageDimension< TInputImage >::ImageDimension >, TOutput >, itk::ImageFunction< TInputImage, NumericTraits< TInputImage::PixelType >::NumericTraits< typename InputImageType::PixelType >::RealType, TCoordRep >, itk::ImageFunction< TInputImage, vnl_matrix< NumericTraits< TInputImage::PixelType::ValueType >::vnl_matrix< typename NumericTraits< typename InputImageType::PixelType::ValueType >::RealType > >, TCoordRep >, itk::ImageFunction< TInputImage, NumericTraits< TInputImage::PixelType >::NumericTraits< typename TInputImage::PixelType >::RealType, TCoordRep >, itk::itk::ImageFunction< TInputImage, itk::FixedArray< NumericTraits< TInputImage::PixelType::ValueType >::itk::FixedArrayVectorDimension >,::itk::GetVectorDimension< TInputImage::PixelType >::VectorDimension >, TCoordRep >, itk::ImageFunction< TInputImage, itk::SymmetricSecondRankTensor< TOutput,::itk::GetImageDimension< TInputImage >::ImageDimension >, TOutput >, itk::ImageFunction< TImageType, NumericTraits< TImageType::PixelType >::RealType, TCoordRep >, itk::ImageFunction< TInputImage, itk::Matrix< double,::itk::GetDimension< TInputImage::PixelType >::Dimension,::itk::GetImageDimension< TInputImage >::ImageDimension >, TCoordRep >, itk::ImageFunction< TInputImage, NumericTraits< TInputImage::InputImageType::PixelType >::NumericTraits< ValueType >::RealType, TCoordRep >, itk::ImageFunction< TInputImage, TInputImage::PixelType, TCoordRep >, itk::ImageFunction< TInputImage, TOutput >, itk::ImageFunction< TInputImage, itk::CovariantVector< double,::itk::GetImageDimension< TInputImage >::ImageDimension >, TCoordRep >, itk::ImageFunction< TInputImage, bool, TCoordRep >, itk::ImageFunction< TInputImage, TOutput, TOutput >, itk::ImageToImageFilter< Superclass::ImageType, Superclass::ImageType >, itk::ImageToImageFilter< TSpeedImage, TLevelSet >, itk::ImageToImageFilter< TDeformationField, TDeformationField >, itk::ImageToImageFilter< itk::Image< std::complex< TPixel >, NDimension >, itk::Image< std::complex< TPixel >, NDimension > >, itk::ImageToImageFilter< TLabelImage, TOutputImage >, itk::ImageToImageFilter< TInputImage, TInputImage >, itk::ImageToImageFilter< TInputImage, itk::VectorImage< TInputImage::InternalPixelType,::itk::GetImageDimension< TInputImage >::ImageDimension > >, itk::ImageToImageFilter< TInputImage, TSparseOutputImage >, itk::ImageToImageFilter< itk::Image< TInputPixelType, 2 >, itk::Image< TOutputPixelType, 2 > >, itk::ImageToImageFilter< itk::Image< itk::SymmetricSecondRankTensor< double, 3 >, 3 >, itk::Image< TPixel, 3 > >, itk::ImageToImageFilter< TInputImage, TLabelImage >, itk::ImageToImageFilter< itk::BloxBoundaryPointImage< dim >, itk::BloxCoreAtomImage< dim > >, itk::ImageToImageFilter< TFeatureImageType, Superclass::ImageType >, itk::ImageToImageFilter< TInputImage1, TOutputImage >, itk::ImageToImageFilter< TImageType, TImageType >, itk::ImageToImageFilter< TInputImage, itk::Image< unsigned char,::itk::GetImageDimension< TInputImage >::ImageDimension > >, itk::ImageToImageFilter< itk::Image< std::complex< TPixel >, Dimension >, itk::Image< TPixel, Dimension > >, itk::ImageToImageFilter< TInputImage, itk::Image< itk::CovariantVector< TOutputValueType,::itk::GetImageDimension< TInputImage >::ImageDimension >,::itk::GetImageDimension< TInputImage >::ImageDimension > >, itk::ImageToImageFilter< TInputImage, itk::VectorImage< TProbabilityPrecisionType,::itk::GetImageDimension< TInputImage >::ImageDimension > >, itk::ImageToImageFilter< itk::Image< TReferenceImagePixelType, 3 >, itk::Image< itk::DiffusionTensor3D< TTensorPixelType >, 3 > >, itk::ImageToImageFilter< TInputImage, itk::Image< TOutputPixelType,::itk::GetImageDimension< TInputImage >::ImageDimension > >, itk::ImageToImageFilter< itk::Image< TPixel, Dimension >, itk::Image< std::complex< TPixel >, Dimension > >, itk::ImageToImageFilter< TInputImage1, itk::Functor::MakeJoin< TInputImage1, TInputImage2 >::ImageType >, itk::ImageToImageFilter< TInputImage, TClassifiedImage >, itk::ImageToImageFilter< TInputImage, TEigenValueImage >, itk::ImageToImageFilter< TInputImage1, TInputImage1 >, itk::ImageToImageFilter< TInputVectorImage, itk::Image< TLabelsType,::itk::GetImageDimension< TInputVectorImage >::ImageDimension > >, itk::ImageToImageFilter< TLevelSet, TLevelSet >, itk::ImageToImageFilter< TInputImage, itk::BloxBoundaryPointImage< ::itk::GetImageDimension< TInputImage >::ImageDimension > >, itk::ImageToImageFilter< itk::Image< TInputPixel1, NDimension >, itk::Image< std::complex< TOutputPixel >, NDimension > >, itk::ImageToImageFilter< TMovingImage, TFixedImage >, itk::ImageToImageFilter< TInputImage, itk::Image< unsigned long,::itk::GetImageDimension< TInputImage >::ImageDimension > >, itk::ImageToImageFilter< TInputImage, itk::Image< itk::CovariantVector< TDataType,::itk::GetImageDimension< TInputImage >::ImageDimension >,::itk::GetImageDimension< TInputImage >::ImageDimension > >, itk::ImageToImageFilter< TSourceImage, itk::BloxBoundaryProfileImage< ::itk::GetImageDimension< TSourceImage >::ImageDimension > >, itk::ImageToImageFilter< TInputImageType, TSparseOutputImageType >, itk::ImageToImageFilter< TDeformationField, TOutputImage >, itk::ImageToImageFilter< TImage, TImage >, itk::InPlaceImageFilter< TDeformationField, TDeformationField >, itk::InPlaceImageFilter< TLabelImage, TOutputImage >, itk::InPlaceImageFilter< TInputImage >, itk::InPlaceImageFilter< TInputImage, TSparseOutputImage >, itk::InPlaceImageFilter< TFeatureImageType, Superclass::ImageType >, itk::InPlaceImageFilter< TInputImage1, TOutputImage >, itk::InPlaceImageFilter< TInputImage, itk::Image< TOutputPixelType,::itk::GetImageDimension< TInputImage >::ImageDimension > >, itk::InPlaceImageFilter< TInputImage1, itk::Functor::MakeJoin< TInputImage1, TInputImage2 >::ImageType >, itk::InPlaceImageFilter< itk::Image< TInputPixel1, NDimension >, itk::Image< std::complex< TOutputPixel >, NDimension > >, itk::InPlaceImageFilter< TInputImageType, TSparseOutputImageType >, itk::InPlaceImageFilter< TImage, TImage >, itk::InteriorExteriorSpatialFunction< VImageDimension, TInput >, itk::InterpolateImageFunction< TImageType, TCoordRep >, itk::MatrixOffsetTransformBase< TScalarType, NDimensions, NDimensions >, itk::MatrixOffsetTransformBase< TScalarType, 2, 2 >, itk::MatrixOffsetTransformBase< TScalarType, 3, 3 >, itk::Mesh< TCoordType, 2, itk::DefaultDynamicMeshTraits< TCoordType, 2, 2, TCoordType > >, itk::Mesh< TPixel, VDimension, TTraits >, itk::MeshSource< itk::VoronoiDiagram2D< TCoordType > >, itk::MeshSource< TOutputPointSet >, itk::MeshSource< TOutput >, itk::ParametricPath< 2 >, itk::Path< double, itk::ContinuousIndex< double, VDimension >, VDimension >, itk::Path< unsigned int, itk::Offset< VDimension >, VDimension >, itk::PathAndImageToPathFilter< TFourierSeriesPath, TSwathMeritImage, itk::OrthogonallyCorrected2DParametricPath >, itk::PathSource< itk::OrthogonallyCorrected2DParametricPath >, itk::PathSource< TOutputChainCodePath >, itk::PathSource< TOutputFourierSeriesPath >, itk::PathSource< itk::PolyLineParametricPath< 2 > >, itk::PathToPathFilter< TInputPath, TOutputChainCodePath >, itk::PathToPathFilter< TFourierSeriesPath, itk::OrthogonallyCorrected2DParametricPath >, itk::PathToPathFilter< TInputChainCodePath, TOutputFourierSeriesPath >, itk::PointSet< TCoordType, VDimension, itk::DefaultDynamicMeshTraits< TCoordType, 2, 2, TCoordType > >, itk::PointSet< TPixel, VDimension, TTraits >, itk::SpatialFunction< double, VSpaceDimension, itk::Point< TCoordRep, VSpaceDimension > >, itk::SpatialFunction< bool,::itk::GetImageDimension< TFunction >::ImageDimension, TFunction::InputType >, itk::SpatialFunction< bool, VDimension, TInput >, itk::SpecialCoordinatesImage< TPixel, 3 >, itk::TreeContainer< itk::SpatialObject< TDimension > * >, itk::VectorImage< TPixelType, Dimension >, itk::Statistics::InputFunctionBase< TMeasurementVector, ScalarType >, itk::Statistics::LearningFunctionBase< LayerType::LayerInterfaceType, TTargetVector >, itk::Statistics::MultilayerNeuralNetworkBase< TMeasurementVector, TTargetVector, itk::Statistics::BackPropagationLayer< TMeasurementVector, TTargetVector > >, itk::Statistics::DistanceMetric< itk::Array< double > >, itk::HistogramToImageFilter< THistogram, itk::Function::HistogramLogProbabilityFunction< unsigned long > >, itk::HistogramToImageFilter< THistogram, itk::Function::HistogramIntensityFunction< unsigned long > >, itk::HistogramToImageFilter< THistogram, itk::Function::HistogramProbabilityFunction< unsigned long > >, itk::HistogramToImageFilter< THistogram, itk::Function::HistogramEntropyFunction< unsigned long > >, itk::Statistics::ImageToListAdaptor< TImage, itk::FixedArray< TImage::PixelType, 1 > >, itk::Statistics::ImageToListAdaptor< TImage, itk::FixedArray< TImage::PixelType, 2 > >, itk::Statistics::ImageToListAdaptor< TImage, itk::Statistics::ImageJointDomainTraits< TImage >::itk::FixedArray >, itk::Statistics::ListSampleBase< itk::Statistics::ImageJointDomainTraits< TImage >::itk::FixedArray< TValueType, VLength > >, itk::Statistics::ListSampleBase< itk::FixedArray< TImage::PixelType, 2 > >, itk::Statistics::ListSampleBase< itk::FixedArray< TImage::PixelType, 1 > >, itk::Statistics::ListSampleBase< TPointSet::PointType >, itk::Statistics::MembershipFunctionBase< itk::Array< double > >, itk::Statistics::MembershipFunctionBase< TMeasurementVector >, itk::Statistics::Sample< itk::Array< TMeasurement > >, itk::Statistics::Sample< itk::Statistics::ImageJointDomainTraits< TImage >::itk::FixedArray< TValueType, VLength > >, itk::Statistics::Sample< itk::FixedArray< TImage::PixelType, 2 > >, itk::Statistics::Sample< TSample::MeasurementVectorType >, itk::Statistics::Sample< itk::FixedArray< TImage::PixelType, 1 > >, itk::Statistics::Sample< itk::FixedArray< TMeasurement, VMeasurementVectorSize > >, itk::Statistics::Sample< TPointSet::PointType >, itk::Statistics::SampleAlgorithmBase< TSample >, itk::Statistics::SampleAlgorithmBase< TInputHistogram >, itk::AnchorErodeDilateImageFilter< TImage, TKernel, std::less< TImage::TImage::PixelType >, std::less_equal< TImage::TImage::PixelType > >, itk::AnchorErodeDilateImageFilter< TImage, TKernel, std::greater< TImage::TImage::PixelType >, std::greater_equal< TImage::TImage::PixelType > >, itk::AnchorOpenCloseImageFilter< TImage, TKernel, std::greater< TImage::PixelType >, std::less< TImage::PixelType >, std::greater_equal< TImage::PixelType >, std::less_equal< TImage::PixelType > >, itk::AnchorOpenCloseImageFilter< TImage, TKernel, std::less< TImage::PixelType >, std::greater< TImage::PixelType >, std::less_equal< TImage::PixelType >, std::greater_equal< TImage::PixelType > >, itk::BoxImageFilter< TImageType, TImageType >, itk::ImageToPathFilter< TInputImage, itk::PolyLineParametricPath< 2 > >, itk::MaskedMovingHistogramImageFilter< TInputImage, TMaskImage, TOutputImage, TKernel, itk::MaskedRankHistogram< TInputImage::PixelType > >, itk::MovingHistogramMorphologyImageFilter< TInputImage, TOutputImage, TKernel, itk::Function::MorphologyHistogram< TInputImage::PixelType, std::less< TInputImage::TInputImage::PixelType > > >, itk::MovingHistogramMorphologyImageFilter< TInputImage, TOutputImage, TKernel, itk::Function::MorphologyHistogram< TInputImage::PixelType, std::greater< TInputImage::TInputImage::PixelType > > >, itk::ValuedRegionalExtremaImageFilter< TInputImage, TOutputImage, std::greater< TInputImage::PixelType >, std::greater< TOutputImage::PixelType > >, itk::ValuedRegionalExtremaImageFilter< TInputImage, TOutputImage, std::less< TInputImage::PixelType >, std::less< TOutputImage::PixelType > >, itk::VanHerkGilWermanErodeDilateImageFilter< TImage, TKernel, itk::MinFunctor< TImage::PixelType > >, itk::VanHerkGilWermanErodeDilateImageFilter< TImage, TKernel, itk::MaxFunctor< TImage::PixelType > >, itk::VTKPolyDataWriter< TMesh >, itk::ImageSpatialObject< TDimension, unsigned char >, itk::SpatialObject< 3 >, itk::SpatialObject< ::itk::GetMeshDimension< TMesh >::PointDimension >, itk::TubeSpatialObject< TDimension, itk::DTITubeSpatialObjectPoint< TDimension > >, and itk::TubeSpatialObject< TDimension, itk::VesselTubeSpatialObjectPoint< TDimension > >. Definition at line 113 of file itkNarrowBand.h. Definition at line 109 of file itkNarrowBand.h. Definition at line 121 of file itkNarrowBand.h. Set/Get the narrow band inner radius. The inner radius is the safe are where the level set can be computed. Definition at line 145 of file itkNarrowBand.h. Sets the reference count on this object. This is a dangerous method, use it with care. Set/Get the narrow band total radius. The narrow band width will be twice this value (positive and negative distance to the zero level set). The user of the narrow band container should set up this value properly. Definition at line 139 of file itkNarrowBand.h. 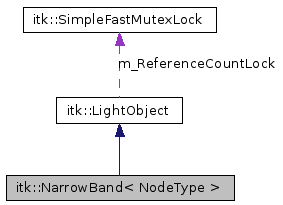 Definition at line 95 of file itkNarrowBand.h. Returns an array of RegionStructs which represent contiguous arrays of nodes within the narrow band. Definition at line 153 of file itkNarrowBand.h. Definition at line 152 of file itkNarrowBand.h.